The Human Balance Laboratory at Mount Sinai School of Medicine, New York, routinely provides clinical videonystagmography (VNG) tests for vestibular and oculomotor functions, as well as the treatment for benign paroxysmal positional vertigo (BPPV). Dr. Mingjia Dai, PhD, assistant professor, has been the director since the lab’s establishment in 1992. The lab was funded by NIH and NASA on the studies in motion sickness and mal de debarquement syndrome (MdDS). As a result of this research, the first-ever effective treatments for MdDS and motion sickness were developed in this lab. We now routinely treat people with MdDS and severe motion sickness. 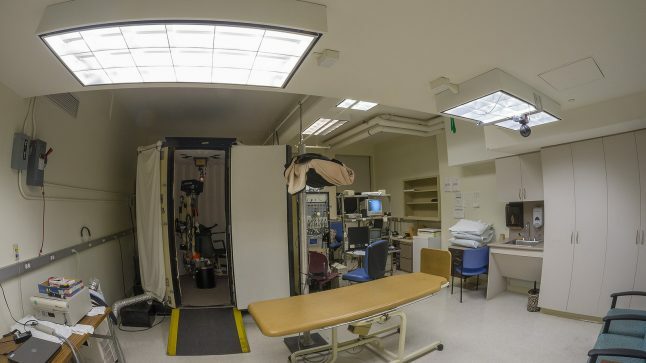 In addition, the lab has been a research hub in the hospital for movement disorders in patients with vestibular and oculomotor deficits, cerebellar atrophy/ataxia, Parkinson disease, multiple system atrophy, familial dysautonomia, and cervical dystonia.